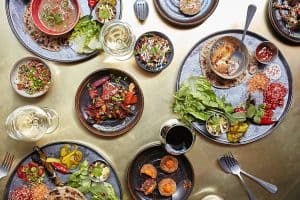 Eighteen months after bringing Mayfair's glitz and glam, the cuisine of the moment and branded cocktails to Angel Court, Coya is carving out it's own niche in the Square Mile. Coya opened its doors in Mayfair back in 2013 in a flurry of plush, jewel-toned interiors and Latin American motifs, slick service, and a very strong offering of the cuisine of the moment – Peruvian. It’s easy to see how the party vibes and location-stamped pisco sours would prove a drawcard for the City set, and why its owners would see fit to open a sister site locally, as well as three more in Abu Dhabi, Dubai and Monte Carlo. But just under 18 months after launching in the new Angel Court development with the same glitzy decor, branded cocktails and Latin American flavours that are still riding high courtesy of executive chef Sanjay Dwivedi, and Coya is carving out its own niche in the City market. 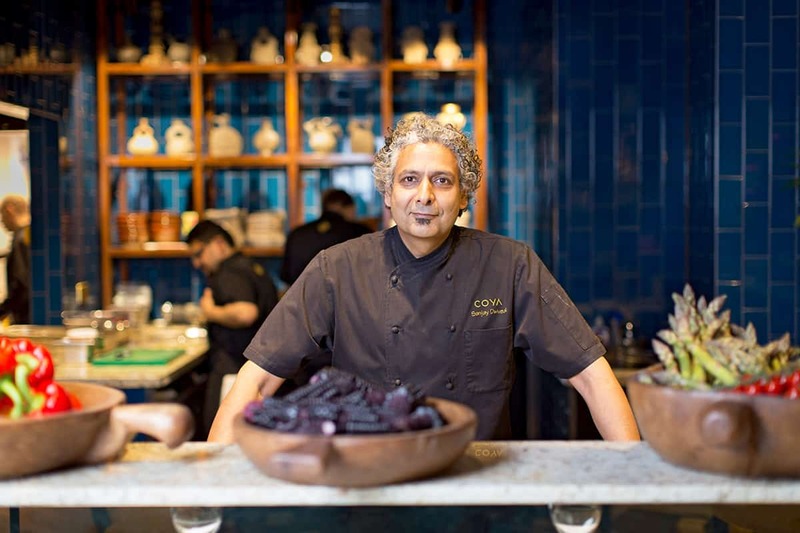 Coya executive chef Sanjay Dwivedi. Sure, there is always going to be a party here on a Friday evening (and Thursday, and Wednesday, which is the new Thursday), but visiting at the sedate hour of 12.30pm on a stinking hot Tuesday in August, we happen across a scene surprisingly well-suited to, of all things, a business lunch. Handshakes can be conducted over the obligatory pisco sour; tart, frothy and branded with the name of the restaurant in a dusting of orange, lest you have too many and forget where you are and how to navigate back to the office. Then get stuck into a menu that draws from all corners of Peru’s culinary melting pot of flavours – chief among them Japanese, Chinese and Spanish – and delivers them with modern European sensibilities; pretty and portioned to pincer and polish off with ease. Starters are split into four options; ceviche, tiraditos, tacos, small plates and skewers, while mains are divided by the nature of the beast (sea and land) with a separate section for the storied cazuelas; iron pots of slow-cooked meats and fragrant rice, but more on those later. There is an express lunch option of two starters and a main for a reasonable £26 but if you have got an extra hour (and the company credit card) order a la carte with a group. Beginning with ceviche is almost a rite of passage in a Peruvian restaurant at this point, and Coya’s are surely among the best in London; plump chunks of corvina cured in a punchy ponzu with a hint of truffle and tender yellowfin, treated to a wonderfully light soy and sesame dressing. 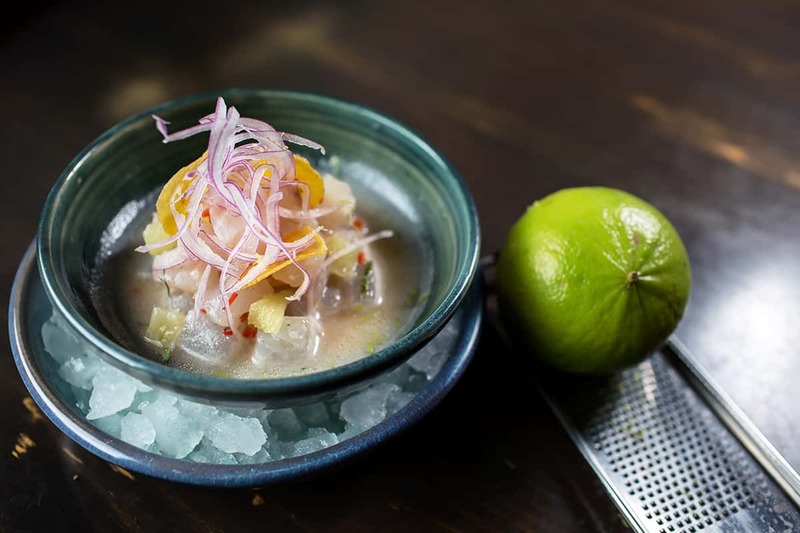 Beginning with ceviche is almost a rite of passage in a Peruvian restaurant, and Coya’s are surely among the best in London. Tiny salmon tacos pack a punch that belies their size – the time-honoured pairing of salmon and avocado lifted by a kick of aji amarillo – while ox heart skewers were a surprise standout, juicy and tender in a red pepper marinade. So far, so many plates and barely a break in conversation in our cushy booth, a surefire sign of a rare gift in working lunch land. As if to illustrate the point, two fat tiger prawns arrive with their meaty innards helpfully sliced and diced and herbed and spiced, and then returned to the shell for presentation wow factor. They are tasty, but pale in comparison to the Arroz Nikkei cazuela that arrives next; a creamy, fragrant risotto of Chilean sea bass, ginger, chilli and lime. 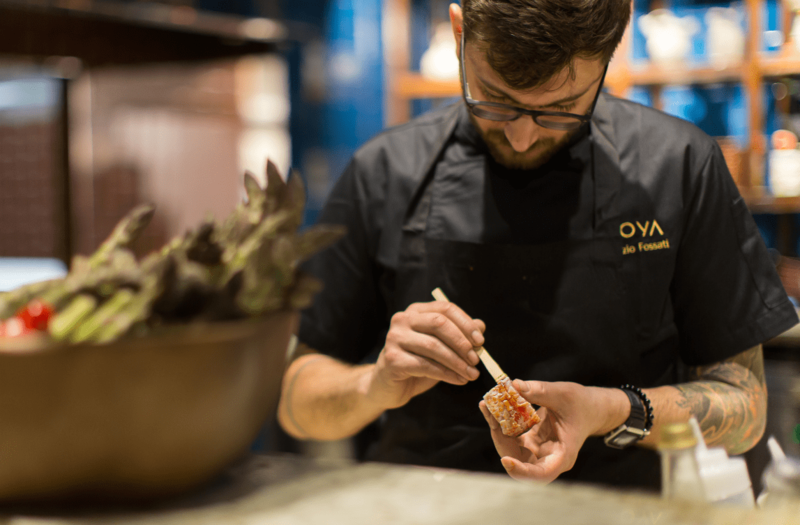 Coya is launching a vegan menu towards the end of the year. Eight dishes plus a starter of guacamole hand-mixed at the table sounds like a recipe for a mid-afternoon nap under the desk, particularly if more than one pisco sour is involved. But traditional Peruvian cuisine is, on the whole, light and healthy, and Coya’s will be even more so once the chef launches his vegan menu towards the end of the year. In summary, if you are a traditionalist who requires a steak knife to cut a deal and a white linen table cloth to mop up afterwards, then save Coya for the celebratory chilli margarita. But if you prefer to let light, punchy and appropriately portioned share plates do at least some of the talking at prices best absorbed by the company expense account, then Coya could be your next boardroom.